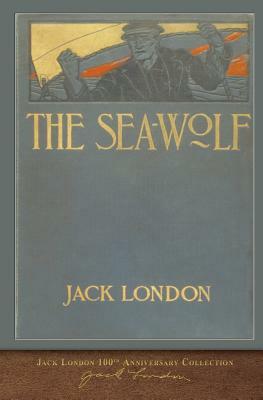 Jack London books by SeaWolf Press were selected for sale by the Jack London Museum. A beautfiul version with the first edition cover and original illustrations. This edition is part of the 100th Anniversary Collection honoring the 100th anniversary of Jack London's death in 1916. In his short 20-year career, he produced more than 50 books. The text and illustrations in this collection are taken from his early publications and the covers are replicas of the first edition covers. Fonts common 100 years ago are used--Century for the text and Bembo on the cover. The book's original format is matched as much as possible. ORIGINAL ILLUSTRATIONS: A literary critic, Humphrey van Weyden, is swept to sea when a San Francisco ferry collides with another ship in dense fog. He is rescued by Wolf Larsen, the powerful captain of the seal-hunting schooner Ghost. Wolf enjoys Humphrey's intellectual companionship but has constant problems with the crew, surviving a violent attempt at mutiny. The ship picks up a female castaway who becomes Humphrey's love interest. They seize an opportunity to steal a boat and escape to an uninhabited island and are eventually rescued by an American cutter.